Sergeant Ed Fizer, USMC (ret.) will receive the Congressional Gold Medal as a member of the Montford Point Marines. Park Forest, IL-(ENEWSPF)- They enlisted to fight for their country during a time of war. In return, they were often ridiculed, taunted, and scorned. They worked even harder to prove themselves, segregated because of the color of their skin, training separately at Montford Point, North Carolina. They excelled. They gave their all. 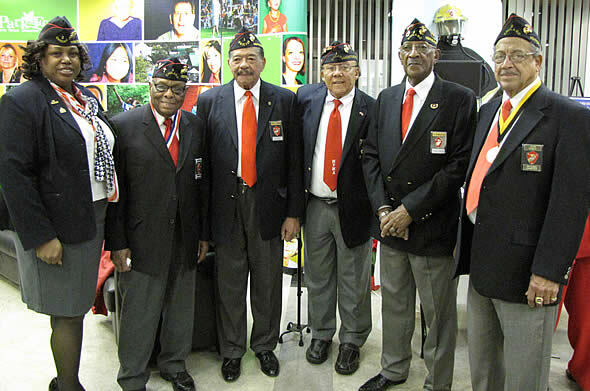 On November 23, 2011, President Barack Obama signed into law a bill to award the Congressional Gold Medal to the Montford Point Marines. 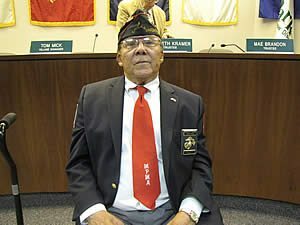 Park Forest resident Sergeant Ed Fizer, USMC, retired, is among the approximate 200 remaining members of the Montford Point Marines who will be honored with the nation’s highest civilian honor for distinguished achievement. How does he feel to be a recipient of such an honor? "It’s dizzying," Sergeant Fizer told ENEWSP when he was recognized at the last Village Board meeting of the year on December 12. Sergeant Fizer closed his public remarks at the board meeting with a resolute, "Hoorah!" after telling the audience, "The wounds of war are not always visible. However, nights like this do help." According to literature provided by Sergeant Fizer, "Since 1776, the United States Marine Corps has served our country in peace and war. Today, the Marine Corps continues to serve as a force in readiness, prepared to go wherever the national interest requires." President Franklin Delano Roosevelt and the Congress decided that a long-standing policy, which had denied participation of a large segment of the population from active, or inactive, service in the Corps, should be abolished. As a result of a presidential directive, black men were recruited for duty with the Marine Corps. These men of color from all states were trained at Montford Point, apart of Camp Lejeune, North Carolina, the largest Marine base in the eastern United States. Approximately twenty thousand black Marines received "boot training" at Montford Point camp from 1942 to 1949, when desegregation in the armed forces was accomplished. Twenty years after World War II, in the summer of 1965, an enterprising group of Marine veterans from the Philadelphia area formed and developed plans to hold a national reunion of Montford Pointers. The late attorney Cecil B. Moore, then president of the largest chapter of the NAACP and later a Philadelphia City Councilman, was a member of this founding group. On September 17 and 18, at the Adelphia Hotel in downtown Philadelphia, over 400 former Marines, returned and active duty Marines representing 17 states, attended this reunion. The patriotic response led to the establishment of the Montford Point Marine Association, Inc., a non-profit veteran organization, chartered in Pennsylvania. Chapters were immediately organized in 11 major cities. To promote and preserve the strong bonds of friendship borne of shared adversaries; and to devote ourselves to the furtherance of these friendships as a Marine through the sharing of experiences and accomplishments to ensure more peaceful times. Since 1965, national conventions have been held in cities around the country where chapters exist, including New York, Cincinnati, Atlanta, the District of Columbia, New Orleans, Cleveland, Los Angeles, San Francisco, Detroit, and Arlington, VA.
On 23 November 2011, the President of the United States signed into law a bill to award the Congressional Gold Medal to the Montford Point Marines. 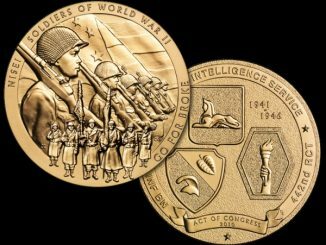 The Congressional Gold Medal is the nation’s highest civilian honor for distinguished achievement. Our Montford Point brothers are patriots. From 1942-1949, nearly 20,000 African-American men from across America came to Montford Point camp in Jacksonville, North Carolina seeking the American Dream of inclusion and the opportunity to defend our country as a United States Marine. Like the wider society at large that was socially and culturally divided by race, the Marine Corps trained these men separately denying them their rightful place in the corps and in its rich tradition of service. These men served in battle, provided critical supplies to those on the front lines and evacuated the wounded to safety. They did their jobs with professionalism and ably proved their courage in epic battles of the pacific like Saipan, Iwo Jima, and Okinawa. Because these men persevered, the Marine Corps underwent a social awakening that laid the foundation for greater equality and opportunity. Many Montford Point Marines carried their exceptional strength of character to their lives outside the Marine Corps, becoming leaders in their communities, mayors, ambassadors, educators, lawyers, ministers, and doctors. Some went on to integrate the shipyards of America, weaving equality of opportunity into the fabric of our society. Their story is one of triumph over adversity. Their legacy of courage and perseverance is an inspiration to all marines. The diversity of today’s Marine Corps was paved in large part by the selfless dedication to duty of the Montford Point Marines. Few of these heroes remain today. Of the nearly 20,000 African-American Marines who went through Montford Point, approximately 200 still survive. 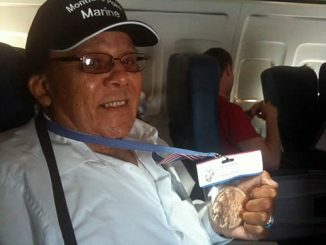 The Congressional Gold Medal will honor all Montford Point Marines from a grateful nation and Marine Corps. This recognition is made possible through the dedicated and persistent work of the Montford Point Marine Association, numerous active, reserve, retired, and civilian marines, and the faithfulness of members of Congress; thank you. Congratulations on a job well done. Semper Fidelis. James F. Amos, General, U.S., Commandant of the Marine Corps. Semper Fidelis, Sergeant Fizer. And a resolute "Hoorah!" to all members of the Montford Point Marine Association, past and present.